A recent film clip showing ex-Israeli academic Ilan Pappé has raised eyebrows. Asked whether it was Palestinians who launched the BDS campaign in 2005, Pappé conceded, "Not really, but yes. OK. For historical records, yes." Both Israel supporters and Israel haters have been taken aback by this forthright statement, from a leading Israel hater, that Palestinians did not create this now iconic movement. What are the BDS movement's origins? The question is, at one level, an historical curiosity. The movement exists, it is forging ever-deeper links with the far left and the "progressive" movement, and is a force to be reckoned with. At another level, however, the history of the BDS movement is emblematic of Palestinian political history, and the recent development of global antisemitism, as a whole. It is easy to dismiss the movement's own origins story, the 2005 call from Palestinian "civil society" organizations. The call for boycotting Israel was in explicit opposition to the Palestinian Authority (which, indeed, rejected it) and may well have originated with a rejectionist PLO faction. Indeed, many of the "grassroots" organizations that signed the document cannot be traced. They were likely organs of political factions or just fabrications. For decades the Palestinian cause has been a pawn of others; the BDS movement is no exception. The message was simple: the "representatives of Palestinian civil society, call upon international civil society organizations and people of conscience all over the world to impose broad boycotts and implement divestment initiatives against Israel similar to those applied to South Africa in the apartheid era. We appeal to you to pressure your respective states to impose embargoes and sanctions against Israel. We also invite conscientious Israelis to support this Call, for the sake of justice and genuine peace." The call also put forward three demands to Israel: "ending its occupation and colonization of all Arab lands and dismantling the Wall;" "recognizing the fundamental rights of the Arab-Palestinian citizens of Israel to full equality;" and "respecting, protecting and promoting the rights of Palestinian refugees to return to their homes and properties as stipulated in UN resolution 194." In short, the call demanded dismantling of Israel through the "right of return." This has not changed: the end of Israel is the core BDS goal. The story from this point is well-known; the "civil society" call burgeoned into an international movement which has had particular success in Europe and in global academia. Among the Palestinians themselves, however, groups like the "Palestinian BDS National Committee," which purports to be the "Palestinian coordinating body for the BDS campaign worldwide," remain mysterious. Only a few individuals can be identified, its funding sources are completely (and characteristically) obscure, but it has had some success encouraging BDS in Arab states, in part under the old Jordanian (and now ubiquitous) slogan of "anti-normalization." But the 2005 "civil society" call built on the academic and cultural boycott launched in 2004, allegedly by Palestinian intellectuals. In fact, the academic boycott was largely the effort of a small group centered on Omar Barghouti (born in Qatar, raised in Egypt, educated in the US), then a graduate student at Tel Aviv University. The academic boycott's questionable success notwithstanding, the fact is that Barghouti was basically a freelancer; with no political base in Palestinian society, he and his "movement" took a well-trodden rejectionist path. Palestinian society, always fearful of appearing to accept the existence of Israel, fell in line. But this history of outside manipulation is much deeper still. The academic boycott as such has roots far outside of the Middle East, specifically in Britain. There, as David Hirsch has pointed out, academics Steven and Hilary Rose, and Mona Baker began to demand Israelis be boycotted in 2002, and in 2003 began agitating for Israel boycotts in British teachers' unions. 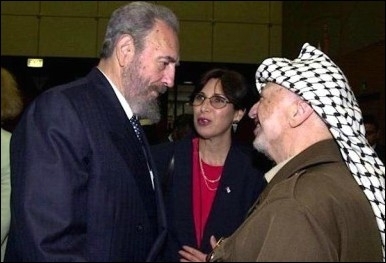 Cuban President Fidel Castro chats with Palestinian Leader Yasser Arafat at the 2001 UN World Conference Against Racism in Durban, South Africa. Prior to their call, however, was the 2001 United Nations "World Conference on Racism, Racial Discrimination, Xenophobia, and Related Intolerance in Durban." The "Durban strategy" was a systematic effort by NGOs to demonize and delegitimize Israel precisely in the manner of apartheid South Africa, and it marked the effective return of the Soviet "Zionism is racism" trope that had been adopted by the UN in 1975. Implicit in the association of Israel with South Africa was boycott and isolation, and the process was given incalculably important support from the heavyweights of the global "human rights" industry, Human Rights Watch and Amnesty International. But the British connection is even deeper and more sinister. Already in 2001 the Palestine Return Centre in London, a Muslim Brotherhood associated group founded in 1986, claimed to have been supporting a boycott of Israel. 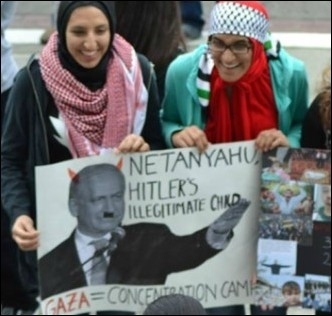 The Palestine Solidarity Campaign (founded in 1982 by Communist Party members including Tony Greenstein, and patronized by current Labour Party leader Jeremy Corbyn) is also at the forefront of Israel-hating in Britain. Its 40 branches have spread the "Israel apartheid" message into British universities and trade unions since the 1980s, and the boycott message since 2001, if not earlier. This "red-green alliance" between Islamists and Communists is critical to understanding BDS past and present. From the 1950s local Communist parties spread the Soviet Union's anti-Zionist message throughout the world, and Soviet support for the PLO, in terms of training, weapons, and ideology, was critical. And from the early 1960s Saudi support for a global network of Islamist organizations like the Muslim World League, World Association of Muslim Youth, and International Islamic Federation of Student Organizations spread that message, including in the US through the Muslim Student Association (founded in 1962). Students for Justice in Palestine campaigners at the University of California-Davis last year. Today, Students for Justice in Palestine and its many chapters are the leading BDS forces on campuses. But at the national level this organization and its parent, American Muslims for Palestine, is controlled by many of the same individuals who were part of the Hamas-supporting Holy Land Foundation and Islamic Association for Palestine. Its personnel overlap with other US Muslim Brotherhood groups such as CAIR and the Muslim American Society, and its alliances with "progressive" organizations, like the Center for Constitutional Rights and National Lawyers Guild, have made BDS and Palestinian rejectionism leading causes of the left. To a large extent BDS in the US is a Muslim Brotherhood project. Add to this far left wing organizations and foundations (Code Pink, the Institute for Policy Studies, the Benjamin Fund, the WESPAC Foundation, and many others), local Arab groups like Al Awda, and putatively religious organizations (such as the American Friends Service Committee, Jewish Voice for Peace, and Presbyterian Church USA), and you have a global Palestinian "movement" in which there are few Palestinians. Even those BDS organizations in Israel and the West Bank, like Badil and Adalah, survive only through financial and other support from Western foundations and European governments, all of which, in effect, use BDS as policy tools against Israel. BDS is a global Palestinian "movement" in which there are few Palestinians. For decades the Palestinian cause has been a pawn of others; the BDS movement is no exception. The Arab League boycott of Jews in 1945 (and arguably, the very formation of the League itself) and the unending manipulations by Islamists, Communists, and Arabs from outside Palestine – including Yassir Arafat – show the extent to which the political fate of Palestinians has been controlled by outsiders with their own agendas. To find indigenous Palestinian-directed boycotts one has to look back a century to the 1910 boycott of Jewish labor in Palestine (on the grounds that Zionists had allegedly boycotted Palestinians), and the boycott of Jewish merchants called for by the 1922 Fifth Arab Congress in Nablus. These failed as economic and political measures, but like the BDS movement today, succeeded in sowing hatred. By the 1930s the Palestinian cause had been internationalized, Islamified, and Palestinian voices began to be lost. The BDS movement extends this into the 21st century. Alexander H. Joffe, a Shillman-Ginsburg fellow at the Middle East Forum, is a historian and archaeologist.